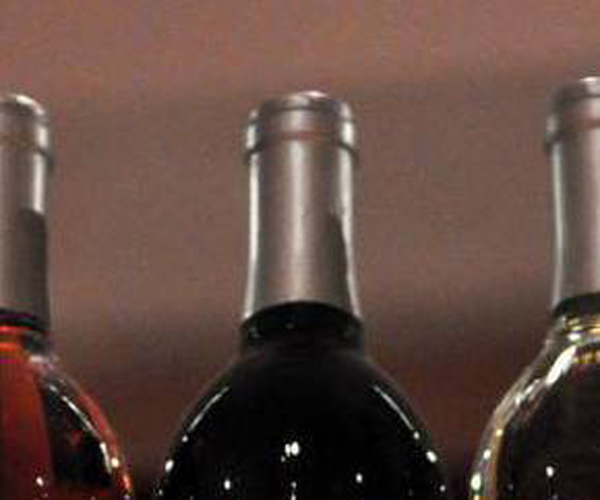 Do you like locally crafted wines, beers, and spirits? What about wood fired pizza and live music? If so, you'll want to enter to win a gift card to The Saratoga Winery! Enter now for your chance to win a $50 gift card to Cornells Restaurant in Schenectady's Little Italy. 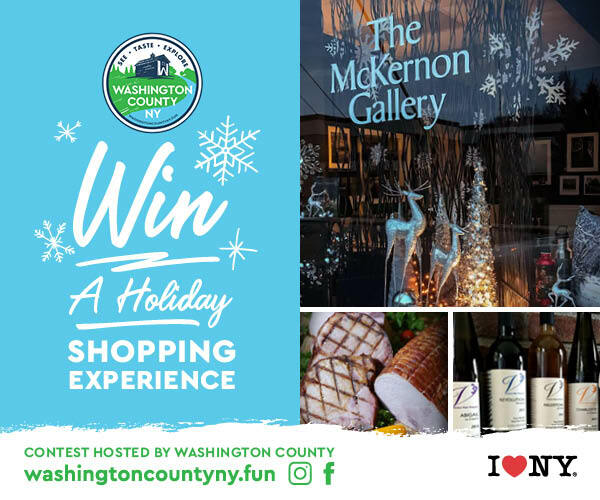 Just in time for holiday shopping season, we're giving away a package of Washington County gift cards worth $250! Enter today for your chance to win. 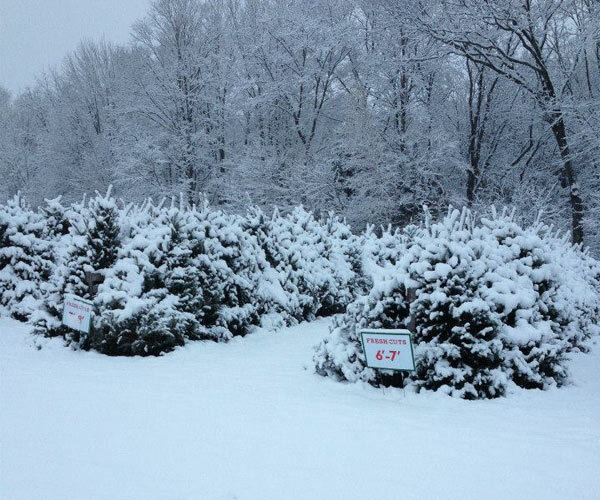 Win A $100 Gift Certificate to Ellms Family Farm Just in Time for the Holidays! Enter to win a $100 gift certificate to Ellms Family Farm, just in time for the holidays! Put it toward a fresh cut tree, a wreath, or other festive items. Enter The Saratoga.com Holiday Extravaganza Giveaway! Ready for the holiday season? 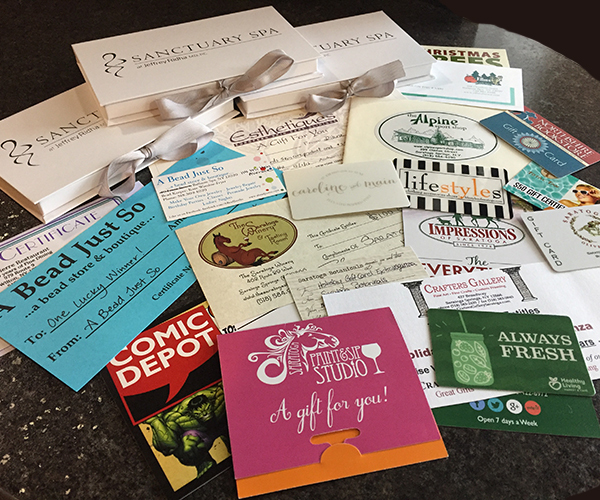 You will be once you've won $500 in gift certificates to businesses in Saratoga Springs! Enter now for your chance to be one of five lucky winners. Winner: Judith L., Alan M., Brian P., Chrissy O. & Sally S.
One lucky winner will receive a prize package including a brewery tour and tasting for two, plus a pair of $50 dining gift cards. 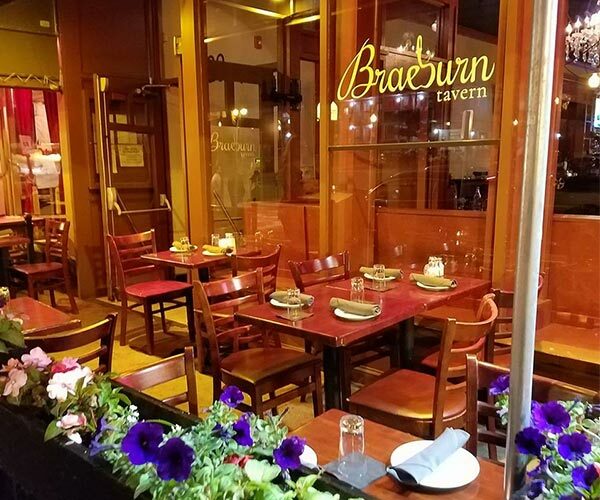 Enjoy delicious, modern American cuisine in downtown Saratoga Springs at Braeburn Tavern. Enter now for your chance to win a $50 gift certificate! Win A $50 Gift Card To Jack's Oyster House! 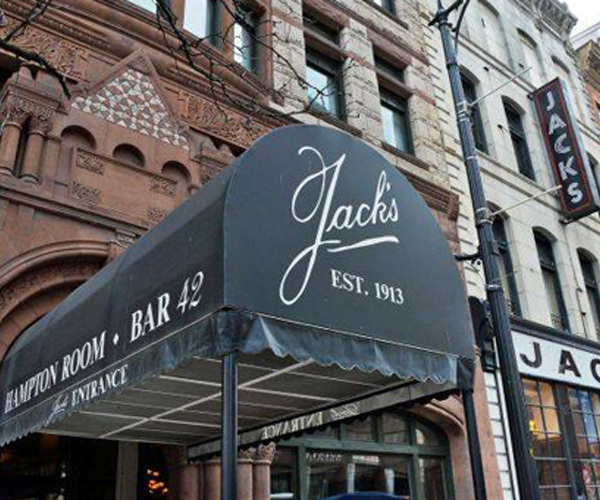 Enter now for your chance to win a $50 gift card to Jack's Oyster House in Albany NY - one of the oldest family-owned restaurants in America! 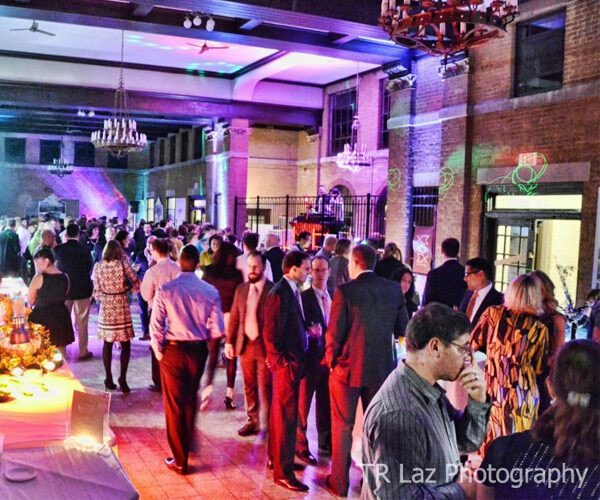 Win Tickets to the FUSION Anti-Gala! Enter now for your chance to win an amazing ticket package to Albany Barn's FUSION Anti-Gala on October 12! 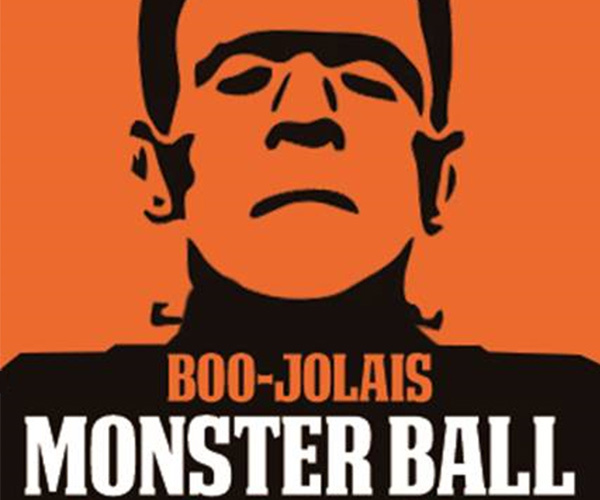 Enter now for a chance to win a pair of tickets to The Alliance for Positive Health's BOO-jolais Monster Ball on Friday, October 26, 2018. 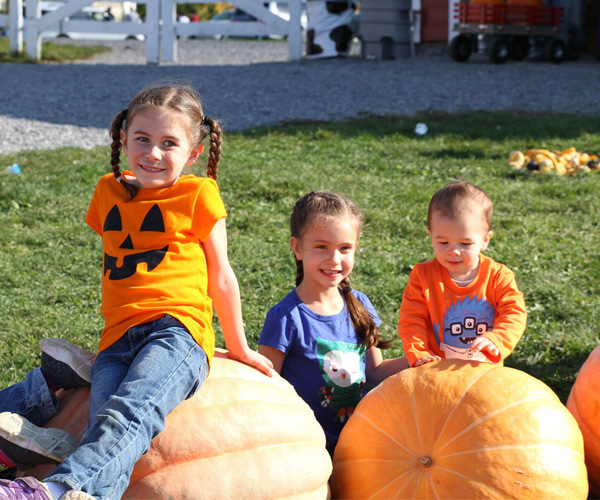 Win Pumpkins, Donuts & Family Fun at Ellms Family Farm! Enter now for your chance to win 4 tickets, a dozen donuts, and 20lbs of pumpkins from Ellms Family Farm in Ballston Spa, NY! 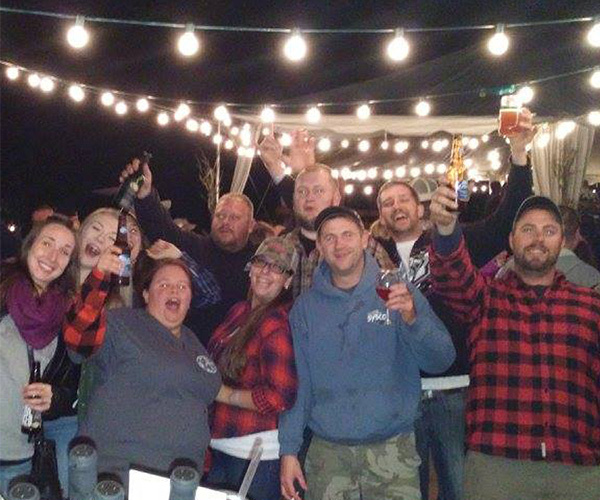 Win Tickets To Saratoga Winery's Hillbilly Bash! 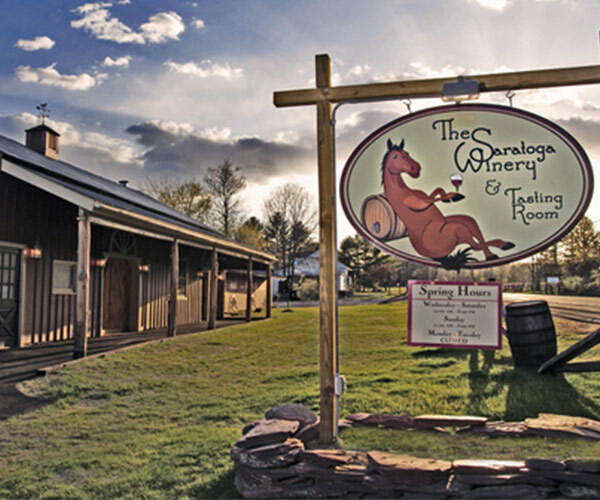 The Saratoga Winery is hosting its annual Hillbilly Bash on September 29 and you and a guest could go for free! Winner: Charlene D., RJ E., Michael J., Steven K., Kelly P., Deb R., Deborah S. & Laurie W.
Win Tickets To Irish 2000! 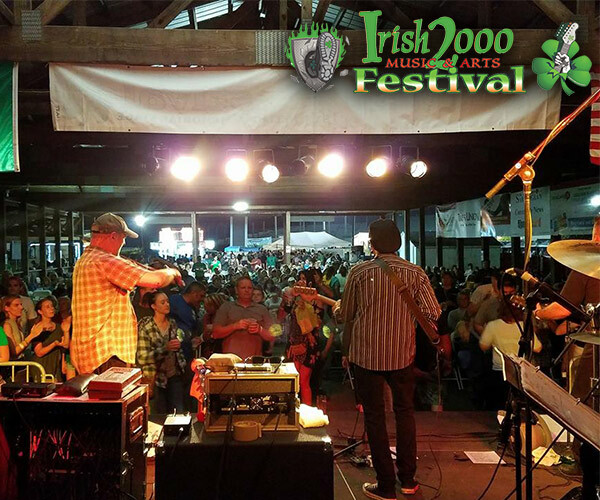 Irish 2000 returns to the Saratoga County Fairgrounds on September 15. Enter now for your chance to win four tickets! Winner: Anthony C., Carol D., Amy F., Mat G., Cory H. & Mary Jane P.
Win Tickets To See Luke Bryan At SPAC! 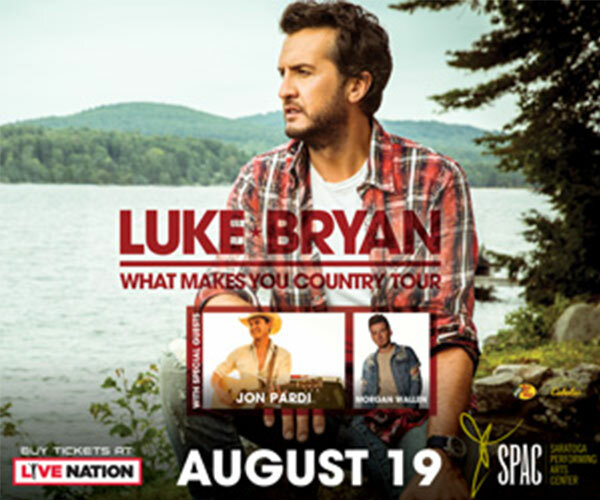 Enter today for your chance to win a four pack of lawn tickets to see Luke Bryan at SPAC on August 19! Win A VIP Family 4-Pack To The Altamont Fair! Enter now for your chance to win full access admission passes and merchandise from the Altamont Fair. 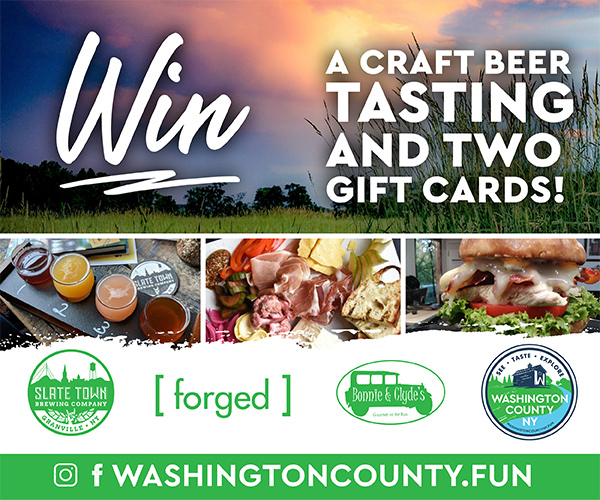 Win A Family Four Pack To The Washington County Fair! 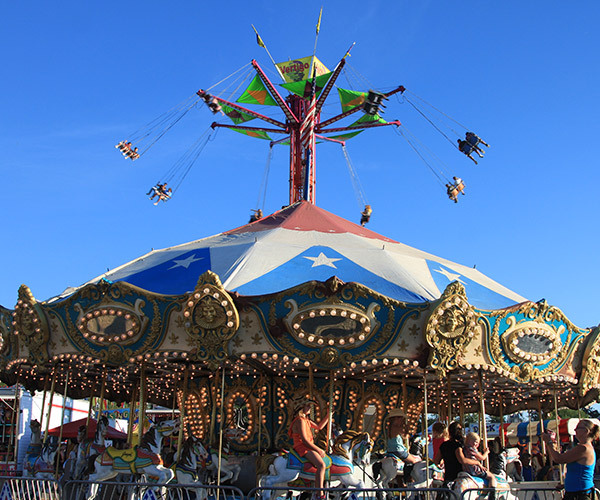 The Washington County Fair returns on August 20 - 26 and your family could go for free! Enter now for your chance to win. 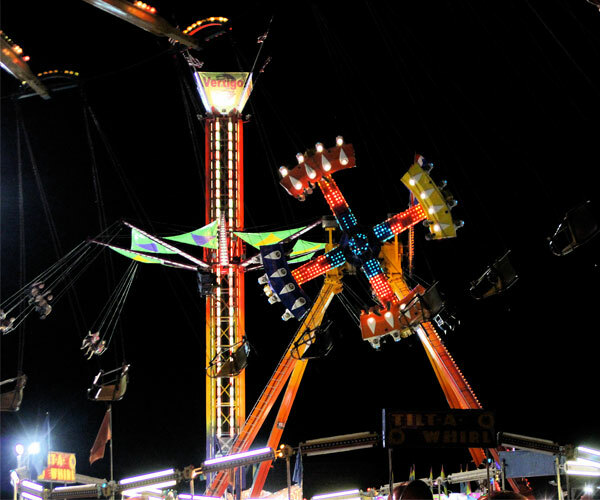 Win Tickets To The Saratoga County Fair! Enter for your chance to win 4 tickets to this year's Saratoga County Fair! 12 winners will be chosen. 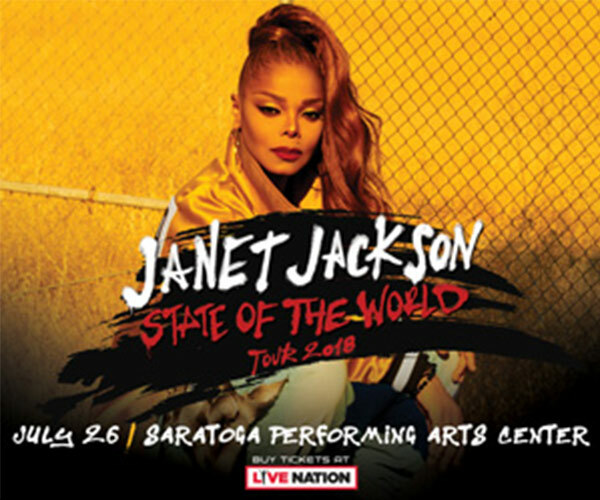 Winner: Mohammed H., Steve S., Sara B., Patty H., Barbara D., Mike L., Jay H., Caitlin R., Nancy P., Melanie W., Anthony C., Nicole S., April W., Joe Z., Laurie W., Steven K., Donna C., Debbie M., Shanthini K., John K.
Win Tickets To See Janet Jackson At SPAC! Enter today for your chance to win a four pack of lawn tickets to see Janet Jackson at SPAC on July 26! Win Tickets To Circus Smirkus! Circus Smirkus returns to Saratoga Casino Hotel on July 9 & 10 and you could go for free! Enter now for your chance to win tickets to this incredible performance. 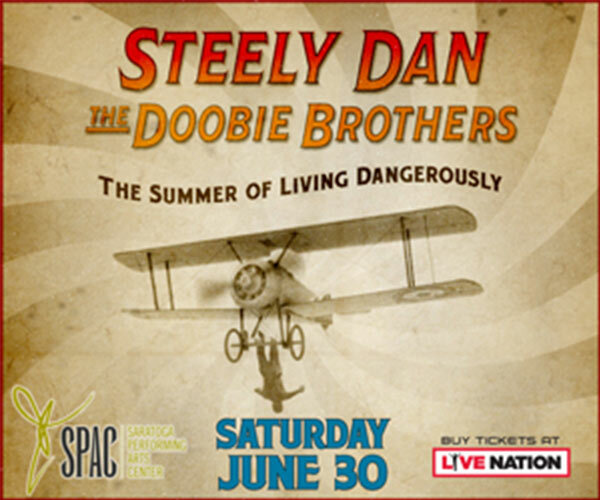 Win Tickets To See Steely Dan & The Doobie Brothers At SPAC! Enter today for your chance to win a four pack of lawn tickets to see Steely Dan and The Doobie Brothers at SPAC on June 30! Win a LAX on Lark Birthday Bucket! 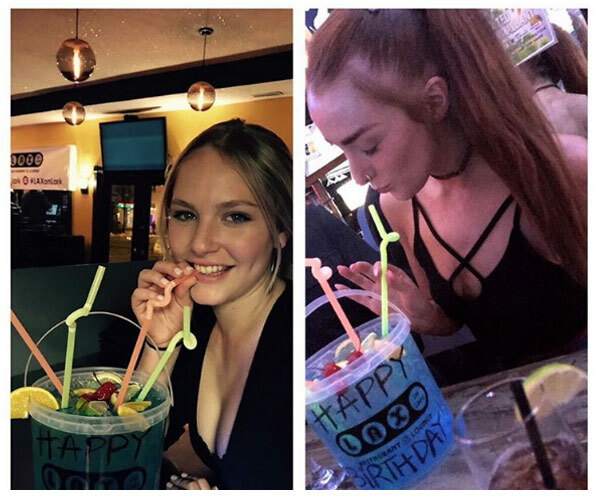 Have a birthday or a friend's birthday coming up? Enter now for your chance to win a Birthday Bucket at LAX on Lark! 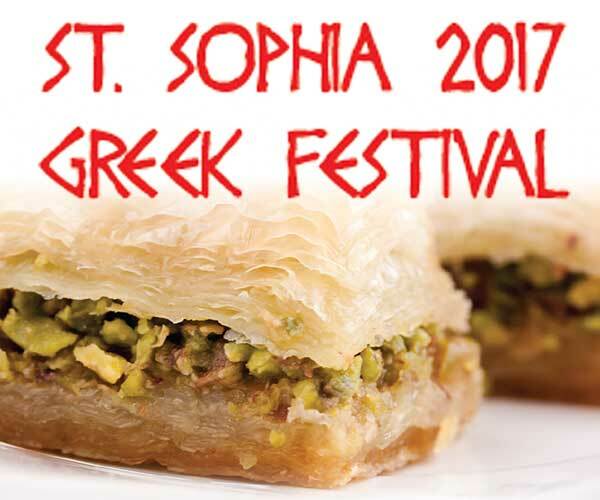 Winner: Diane A., Robert H., Dennis K., Jennifer N., Sara V.
Win A Family Four Pack To The St. Sophia 2018 Greek Festival! Enter now for your chance to win four admission tickets to the 2018 St. Sophia Greek Festival, Greek food and pastries, hot and cold beverages, and more! 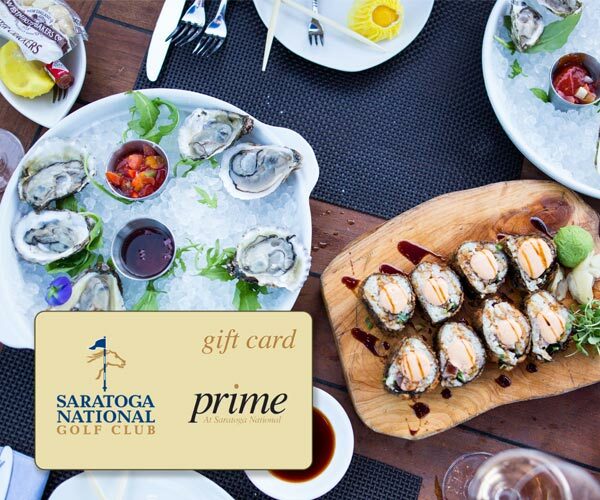 Win A Gift Certificate For Lunch At Prime! Lunch at Prime is in full swing! Enter now for your chance to win a $100 gift certificate you can use on a delectable lunch at Prime. 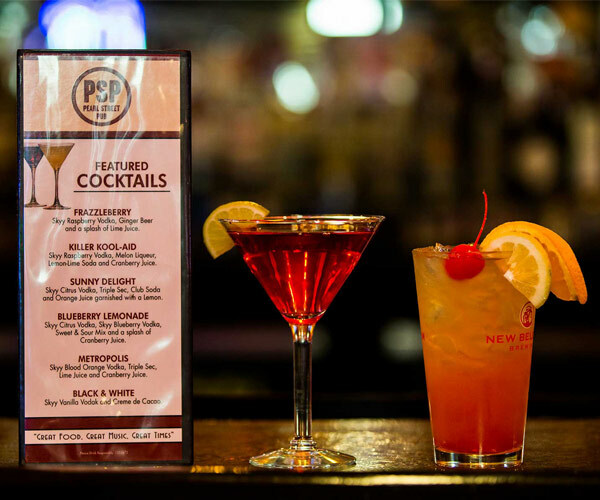 Winner: Natalia A., Shirley B., Matthew D., Linda H., Raymond S.
Pearl Street Pub is the place to go for delicious food, amazing nightlife, and refreshing drinks in downtown Albany! Enter now for your chance to win a $50 gift certificate. Winner: Robyn A., Michael J., John P., Randee R., Sharon W.
Win An Overnight In Glens Falls! Enter today for your chance to win an overnight in Glens Falls, complete with entertainment and food! 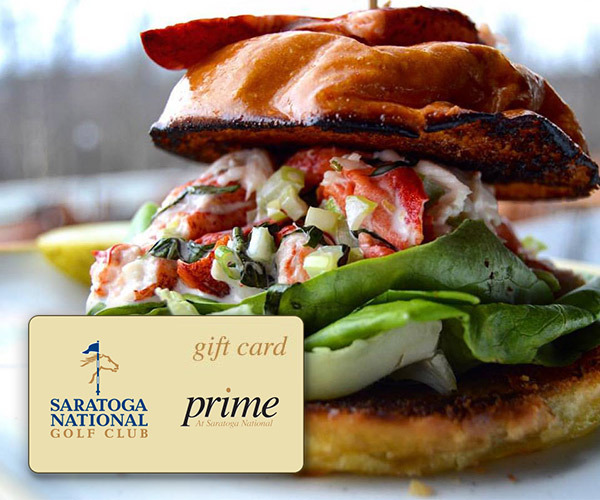 Enter today for your chance to win a $250 gift card to Prime at Saratoga National Golf Club, featuring fine dining in a relaxed atmosphere. 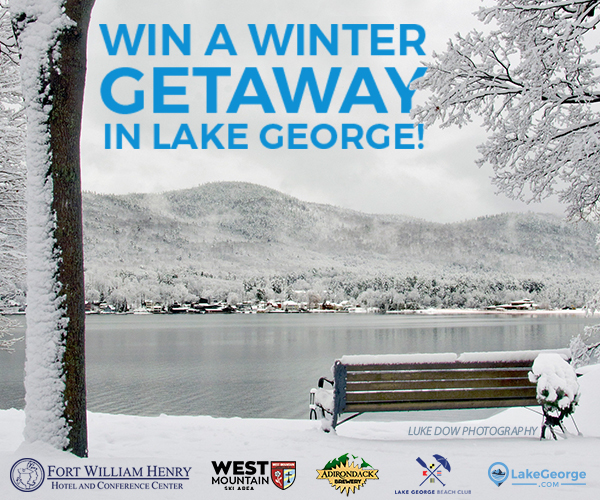 Win A Winter Getaway In Lake George! 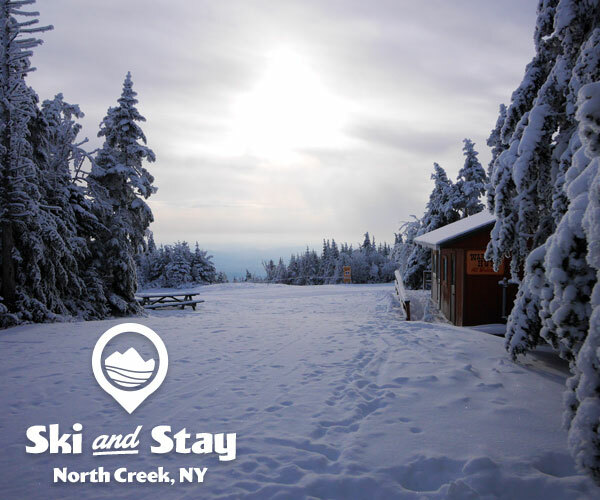 Enter to win a winter getaway in Lake George, NY featuring a two night stay at Fort William Henry Hotel, four lift tickets to West Mountain Ski Area, and $50 to both the Adirondack Pub & Brewery, and Lake George Beach Club. Win A Ski & Stay Package! Enter to win a Ski & Stay Package featuring two weekday, non-holiday overnights at The Alpine Lodge and four non-holiday passes to Gore Mountain. 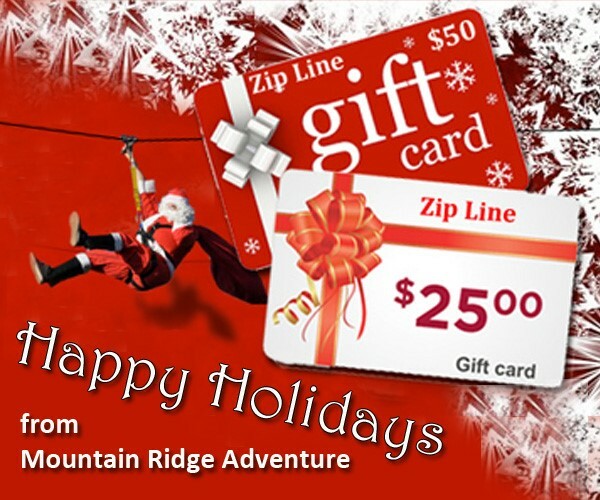 Enjoy a day of fun and excitement with the whole family when you win a Family 4 Pack of Holiday Gift Passes to Mountain Ridge Adventure. They make great stocking stuffers! 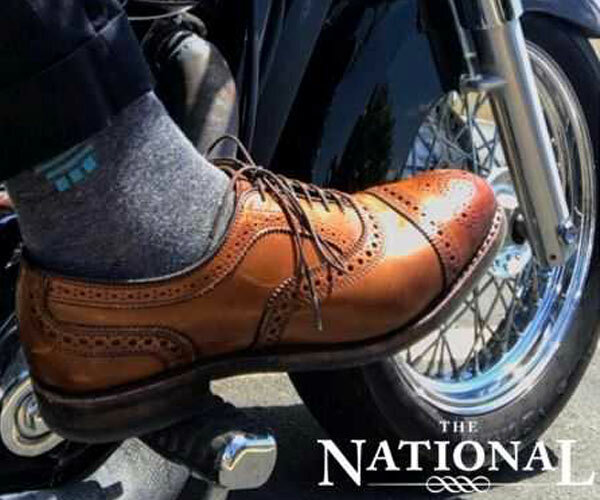 Just in time for the holiday gift-giving season, The National by Saratoga National Golf Club is giving away a pair of Allen Edmonds Strand Cap-Toe Oxford Mens Dress Shoes. 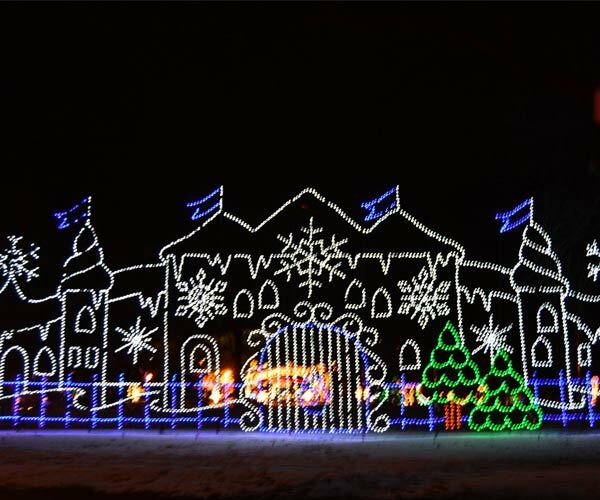 The Price Chopper/Market 32 Capital Holiday Lights in the Park is one of the most popular holiday attractions in the Capital Region, and your family could go for free! Winner: David B., Diane C., April C., Tammy D., Deb F., Lori G., Sue H., Julie T., & Joanne W.
Win A Pair Of Tickets To Ski-QX Winter Music Festival At Stratton! Enter for your chance to win a pair of tickets to Ski-QX Winter Music Festival on December 8 & 9 presented by Stratton Mountain Resort and WEQX. Win A Private Party At Saratoga Paint & Sip Studio In Latham! Grab a drink, an apron and take a seat! 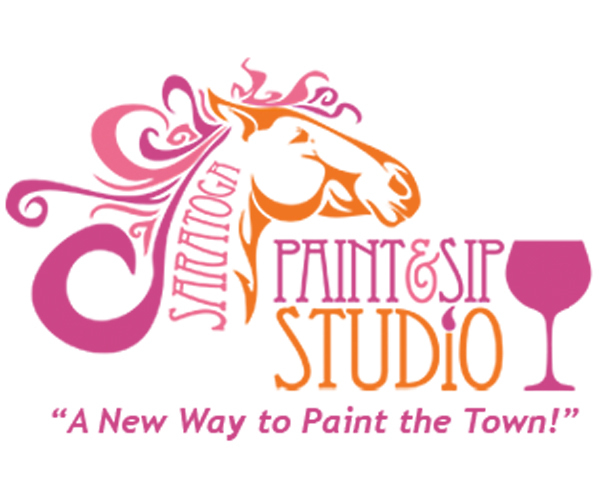 Enter for your chance to win a private party at Saratoga Paint & Sip Studio's Latham location. Ready for the holiday season? 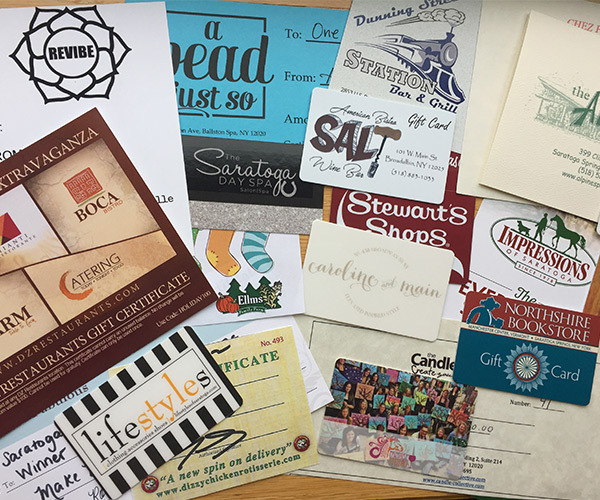 You will be once you've won $500 in gift certificates to businesses in Saratoga Springs! Enter now for your chance to be one of six lucky winners. Winner: Mary B., Tim B., Jodi J., Sharon L., John R. & Susan S.
Win VIP Tickets to Escape Saratoga on November 18! 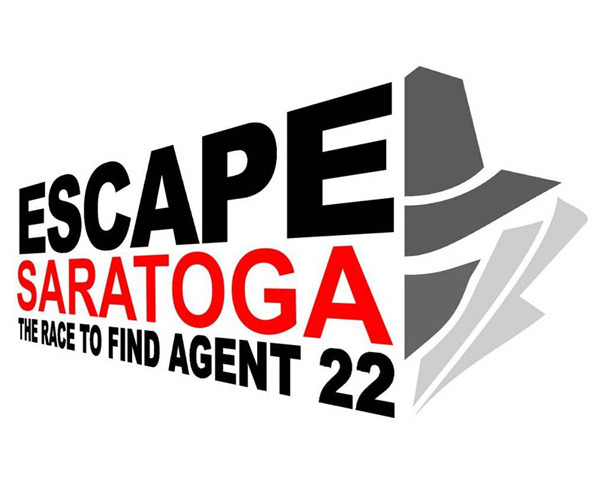 Escape Saratoga is part scavenger hunt, part escape game, and all fun and excitement! 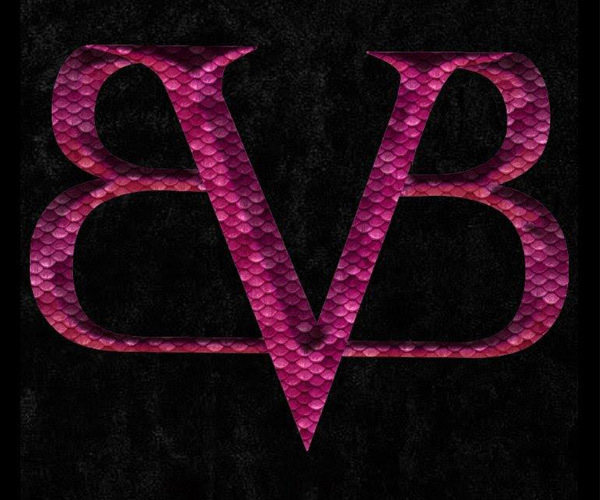 One lucky winner will receive a pair of VIP tickets for this one-of-a-kind event. Enter now for your chance to win a Family 4-Pack (including 4 tickets, a dozen donuts, and 20lbs in pumpkins) to Ellms Family Farm in Ballston Spa, NY! Enter now for your chance to win a pair of tickets to The Alliance for Positive Health's BOO-jolais Vampire Ball on Friday, October 27, 2017. 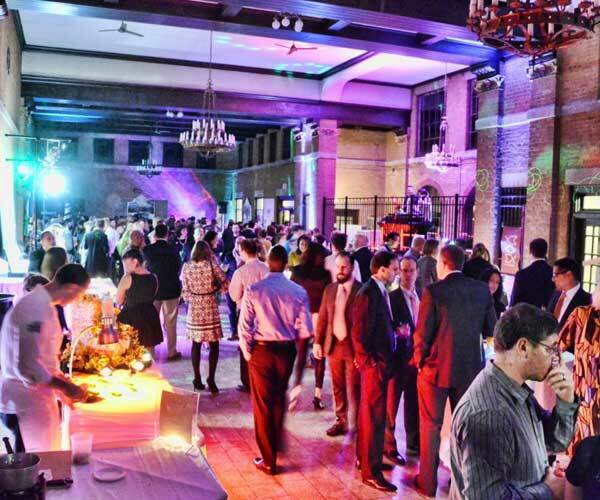 Enter now for your chance to win an amazing ticket package to Albany Barn's FUSION Anti-Gala on October 20! Win 8 Seats At Any Paint & Sip Event! Grab a drink, an apron and take a seat! Enter for a chance to win 8 seats at any Saratoga Paint & Sip Studio event happening at the Latham location. Win A Gift Card To Jack's Oyster House! 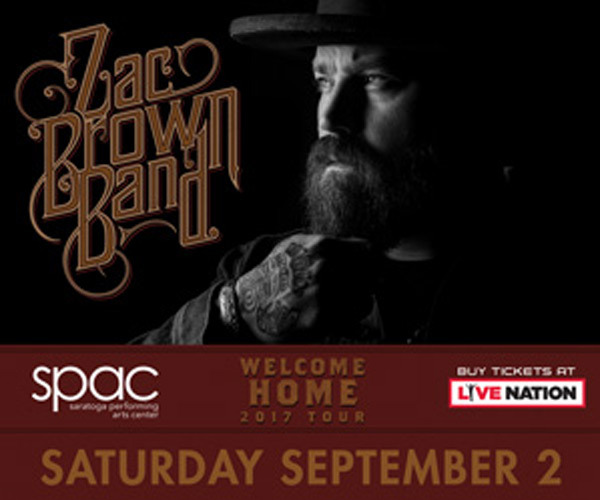 Winner: Deborah P., Lynn D., Kathi D., John Q., & Ashley L.
Win Tickets to See Zac Brown Band at SPAC! Enter today for your chance to win a four pack of lawn tickets to see Zac Brown Band at SPAC on September 2! 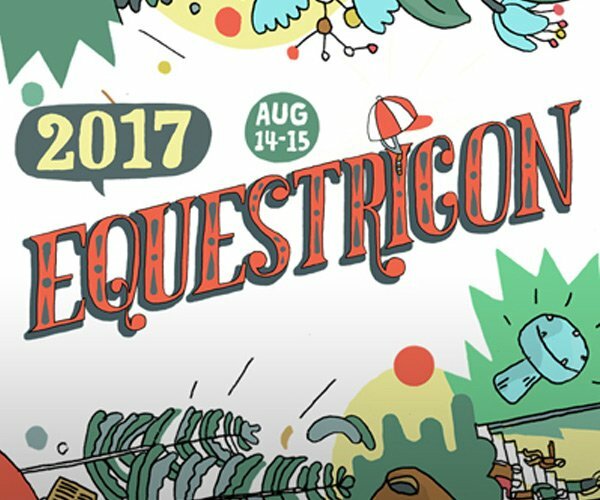 Enter now for your chance to win a pair of Equestricon Panel Passes giving you access to the inaugural event at the Saratoga Springs City Center on August 14 & 15. Winner: Sarah P., Daniel K., Aleah W.
Enter now for your chance to win a VIP Family 4-Pack to the Altamont Fair, returning for 2017 from August 15-20. 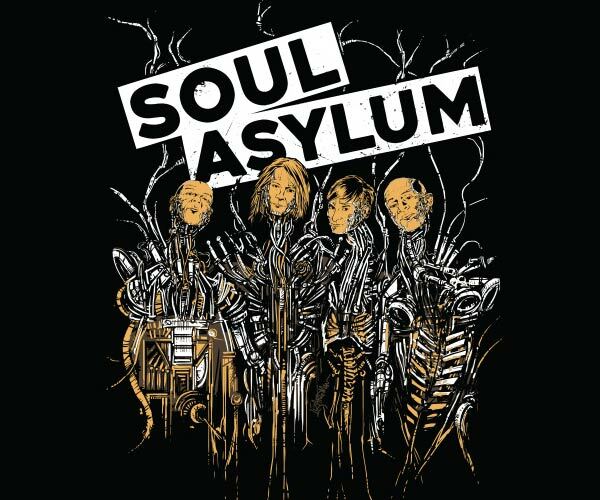 Soul Asylum is performing live at Empire State Plaza on July 19 and you could win four passes for a meet and greet with the band before the show! Winner: Cindy D., James C., & Linda H.
Win Tickets to See Rod Stewart with Cyndi Lauper at SPAC! 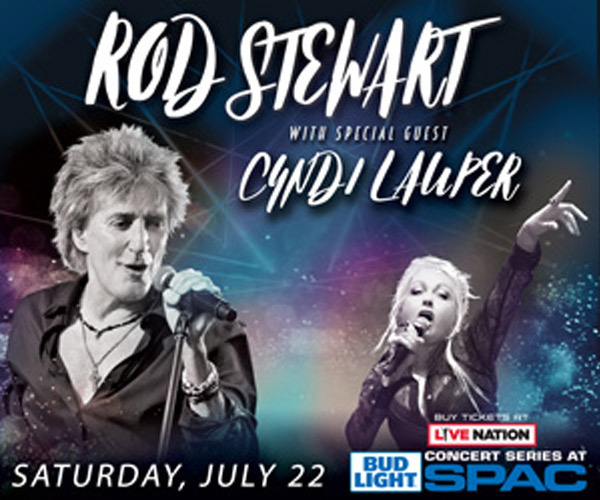 Enter today for your chance to win a four pack of lawn tickets to see Rod Stewart with Cyndi Lauper at SPAC on July 22! Enter for your chance to win 4 tickets to this year's Saratoga County Fair! 15 Winners will be chosen! Winner: Paul C., Courtney R., Stacy B., Jane C., Marilyn F., Holly V., Nancy H., Clarence H., Michelle S., Jennifer S., Dawn M., Alison T., Steve C., Raylene H., Natasha B., Charlene D., Sara V., Jim K., Karen H., & Jim N.
Winner: Giovannine M. & Angela C.
Grab a drink, an apron and take a seat! Enter for a chance to win 8 seats at any Saratoga Paint & Sip Studio event happening at the Saratoga Springs location. 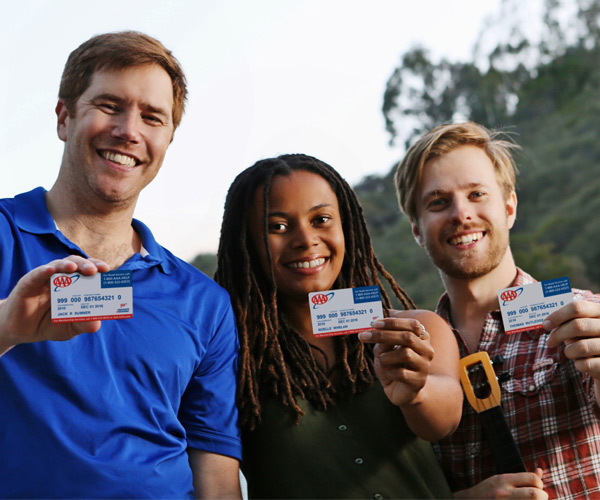 Enter to win a Classic Membership from AAA Northway and take advantage of the nation's most trusted roadside assistance provider. Winner: Jamie B., Angela B., Natalia A. Win Tickets to See Train at SPAC! 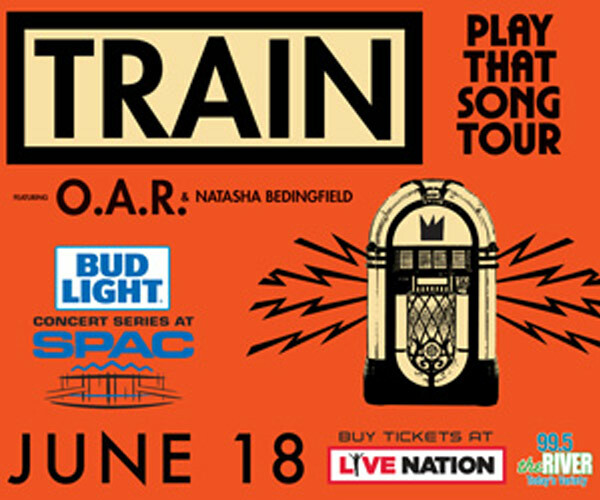 Enter today for your chance to win a four pack of lawn tickets to see Train with O.A.R. and Natasha Bedingfield at SPAC on June 18! Win Passes To The Double H Ranch Gala! Enjoy a night of fun with the whole family for a great cause! Enter now to win a Family Pack of passes to the Double H Ranch 25th Anniversary Gala. Winner: Carol G. & Sandra I. Win A Family 4 Pack Of Passes To Mountain Ridge Adventure! 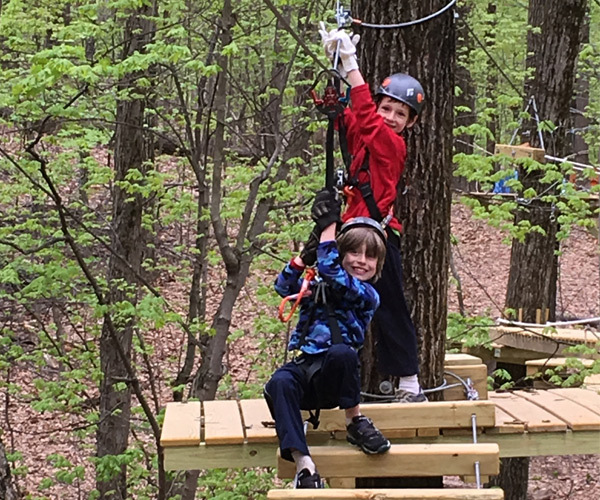 Enjoy a day of fun and excitement with the whole family when you win a Family 4 Pack of Treetop Passes to Mountain Ridge Adventure! 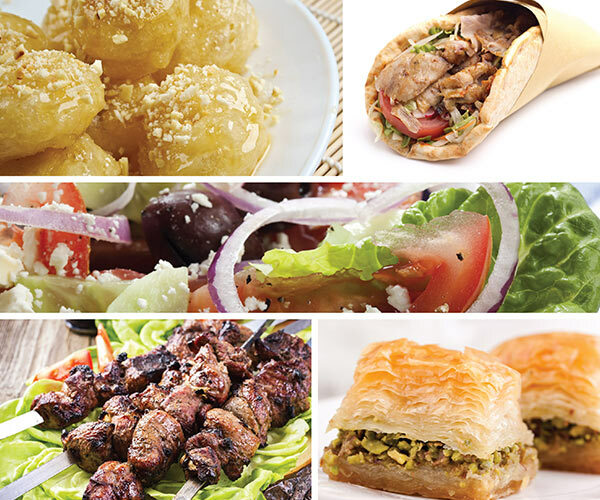 Enter this giveaway and you could win a four pack of admission tickets, 4 meals, $75 gift certificate for the dining room, a box of pastries, and 2 containers of Loukoumades from the St. Sophia Greek Festival in May! 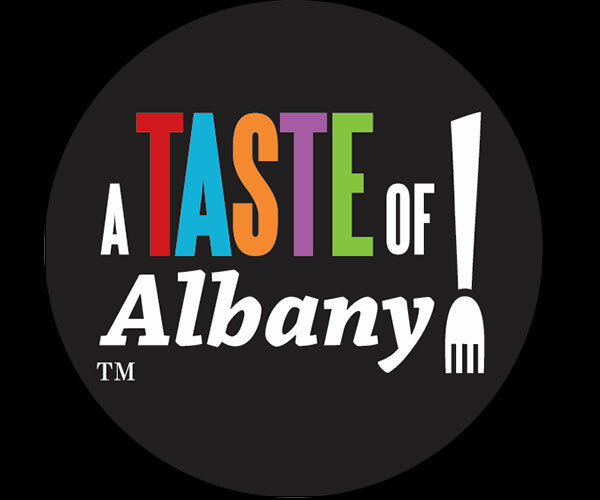 Enter this giveaway and you could win a pair of terrace table tickets with reserved seating for A Taste Of Albany event at the NYS Museum on May 4th. Win A Pair of Tickets to Freihofer's Jazz Festival at SPAC! 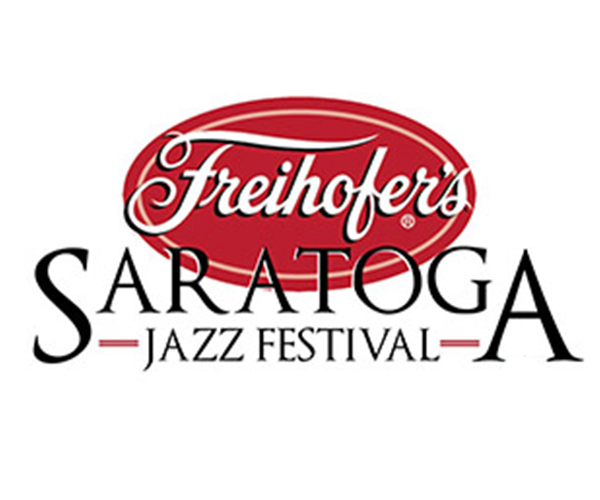 Enter for a chance to win a pair of tickets to Freihofer's Jazz Festival at Saratoga Performing Arts Center on on June 25th! Enter this giveaway and you could win a $25 to LAX on Lark Restaurant & Lounge in Albany, NY. 10 winners will be selected. 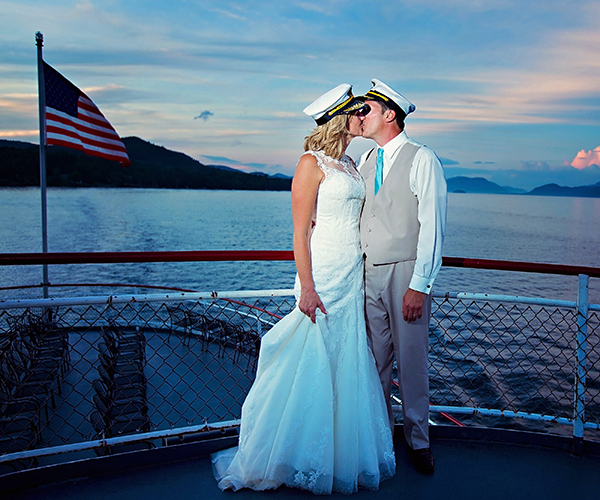 Win a $15,000 Wedding Of Your Dreams On Lake George!! 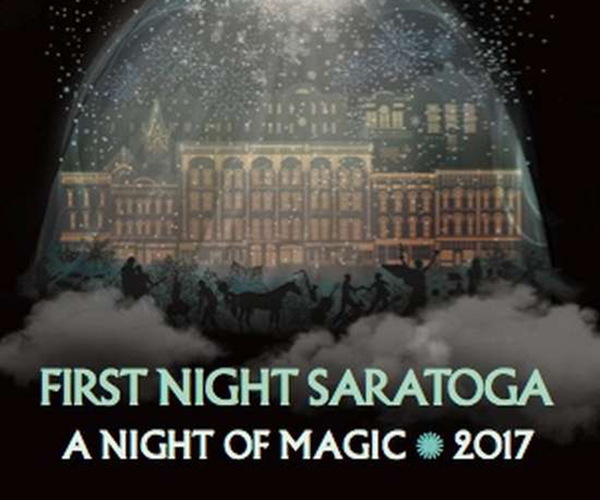 Win an Overnight Package to First Night Saratoga! Is there a better way to bring in the New Year in Saratoga than with this VIP treatment? Enter to win an overnight package to First Night! Sweepstakes includes: two tickets to First Night, Dinner in Saratoga Springs on New Year's Eve, Overnight Stay One Room Double Occupancy and a Saratoga Welcome Gift! Contest provided by Saratoga County Tourism! $100 Gift Certificate to Ellms Family Farm Just in Time for the Holidays! Enter to win $100 to Ellms Family Farm, for free and just in time for the holidays! Ready for the Holidays? Well, you will be once you've won $500 in gift cards/certificates for businesses in Saratoga Springs (four winners)! Enter for free here! Winner: James S from Hudson, NY. Cheryl L from Greenfield Center, NY. Joanne H from Clifton Park, NY. Greg R from Mechanicville, NY. 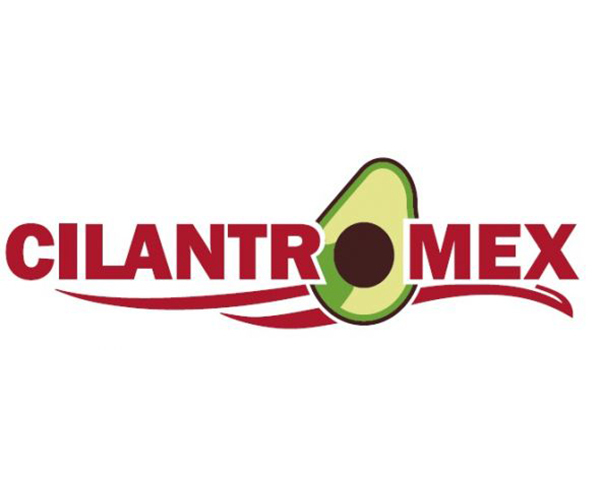 Enter this giveaway and you could win a $15 to CilantroMex at Crossgates Mall in Albany, NY. Five winners will be selected. Winner: Ashley D, Linda H, Sue H, Donna C & Theresa J. Who doesn't love food, dancing, music & wine (with a Halloween theme)? Here's your chance to win two tickets to The Alliance for Positive Health's BOO-jolais Wine Celebration on October 28th. 8 Seats To Any Paint & Sip Event! Grab a drink, an apron and take a seat! Enter for a chance to win 8 seats at any Saratoga Paint & Sip Studio event at the Latham Location! Enter this contest for a chance to win a Family 4-pack (4 tickets, a dozen donuts and 20lbs in pumpkins) to Ellms Family Farm in Ballston Spa, NY! Choose from dozens of harvest and fall-themed beers and locally harvested and prepared food...for FREE! Enter to win 10 tickets to the Saratoga Harvest Fest. Winner: Michael A, Mary S, Matthew F, Shannon G, Tiffany L, Chris M, Vincent C, Stacy B. 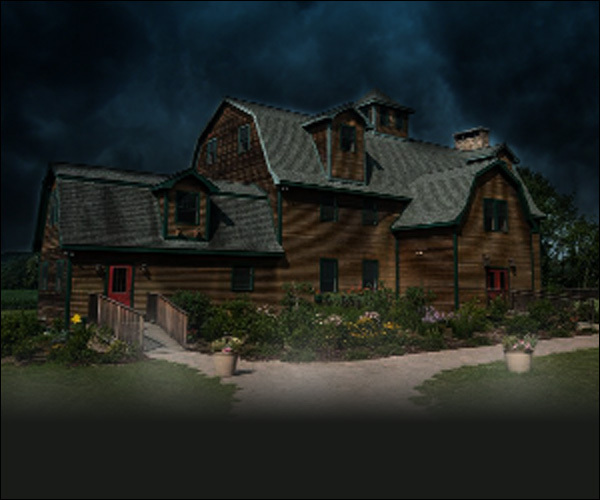 Win a Nightmares Liberty Ridge Farm Haunt Package! Winner: Michael B, Russ M, Ashleee D, Mat G, Dennis M, John H, Wayne H, Cherie Q, Mary H, Shannon D.
Here's your chance to go to FUSION, the anti-gala at Albany Barn on Friday, October 14th! Win a Fall Family Fun Package to Liberty Ridge Farm! Enter this giveaway and you could win a VIP Ticket Package for two to The Hillbilly Bash at The Saratoga Winery (2 winners will be chosen)! Win Tickets to See Zac Brown Band on September 3rd at SPAC! Enter for a chance to win 4 tickets to go see Zac Brown Band play at Saratoga Performing Arts Center on on September 3rd! Win a VIP Family 4-pack to the Altamont Fair, August 16th through August 21st. Enter NOW! See The Commodores at the Empire State Plaza on August 10th With Backstage Passes! Here's your chance to see The Commodores backstage before their performance on August 10th in Albany! The 2016 Ultimate Saratoga Giveaway! Is there a better place to be than Saratoga in the summer? Enter to win an ultimate 4 Day/3 Night, Jam-Packed, Fun-Filled Vacation for 2 in Saratoga Springs NY provided by Saratoga County Tourism ($2,500+ value)! Enjoy sumptuous accommodations, excellent golfing, fabulous dining, a luxurious spa experience, tickets to the Saratoga Performing Arts Center, reserved seating at Saratoga Race Course, deluxe gift basket and more! Enter For A Chance to Dine & Stay At Longfellows In Saratoga Springs NY! Enter NOW for your chance to win an overnight stay and dinner at Longfellows in Saratoga Springs NY! Win Tickets to See Luke Bryan on July 31st at SPAC! Enter for a chance to win 4 tickets to go see Luke Bryan play at Saratoga Performing Arts Center on Sunday, July 31st! Win Two Tickets To The VIP Paddock Tent Wine Tasting on July 23rd! Enter for your chance to win 4 tickets to this year's Saratoga County Fair! 15 Winners will be chosen!! Winner: Julie D, David C, Bridgette A, Suzanna H/W, Vishal C, Kathy B, Rosa C, Gail R, Kim G, Roni C, Robert B, Karyn W, Lori W, Kaley S, Michele G.
Win Two Southwest Gift Cards & Valet Parking At The Albany International Airport! Enjoy $200 in Gift Cards to Southwest Airlines and 1 Week of Valet Parking Services at The Albany International Airport! Win Tickets to See Miranda Lambert on June 24th at SPAC! Enter for a chance to win 4 tickets to go see Miranda Lambert play at Saratoga Performing Arts Center on Friday, June 24th! Want to win the ultimate trip of a lifetime? Enter to win a 6 day vacation to Peru, courtesy of the Escape Artist! Explore Machu Picchu, Lima, Sacred Valley and Cuzco - among other destinations in Peru! The Peru giveaway is valued at $3500 and includes round trip airfare, hotel accommodations, guided tours, meals, and more! Don't miss the opportunity to explore this breathtaking country in South America. Enter Now! Enter to win Gold Seats at the LakeGeorge.com Elvis Fest in Lake George, NY! Winner: Todd R, Patricia V, Lyle R & Carol P.
Win The Ultimate VIP Experience At The Saratoga Brewfest on May 21st! Win a Limo Ride & Four Tickets To See The Lion King At Proctor's Theater! The Great Upstate Boat Show: Four Pack Ticket Giveaway! Start summer a little early with a four-pack of tickets to the Great Upstate Boat Show on April 1st-3rd in Queensbury, NY. Winner: Todd R, John S, Shelby R, Regina M, Denise P, Lynne D, Tessa V, James C, Robyn E, Sharon W, Katie S, Corrine T, Tony C, Danielle C, Jen R, Deb F, Stacy B, Don P, Sylvia S, Andrew H, Jim N, Jade K, Hugo G, Travis V, Bim R, Melanie H, WEndy H, Deanna R, Nancy H, Brad R, Adriene T, Shannon S, Helen M, Amy W, Tim B, Mercedes A. 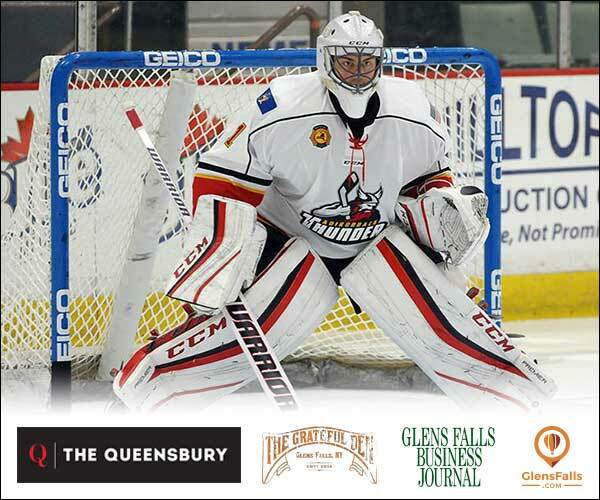 Want To See The Adirondack Thunder for FREE in Glens Falls, NY? Here's your chance to win a family four pack (includes tickets and hot dogs) to a Adirondack Thunder home game of your choice for the remainder of the 2015-2016 season! Here's your chance to win 4 tickets to a Adirondack Thunder game on January 16th verus the Reading Royals! Win a Serendipity Arts Studio $25 Gift Card -- 8 Winners! Art you can try, touch and taste! Enter now for your chance to win a $25 gift card to Serendipity Arts Studio. Winner: Denise P, Kristin H, Tricia H, Mary H, Jay H, Katherine L, Nicole M, Tammy S.
Get ready sports fans! Here's your chance to win 4 tickets to a Adirondack Thunder game on December 26th verus the Manchester Monarchs! Ultimate Greens Giveaway Just in Time for the Holidays! Enter to win two wreaths, a Christmas tree and a dozen apple cider donuts, for free and just in time for the holidays! 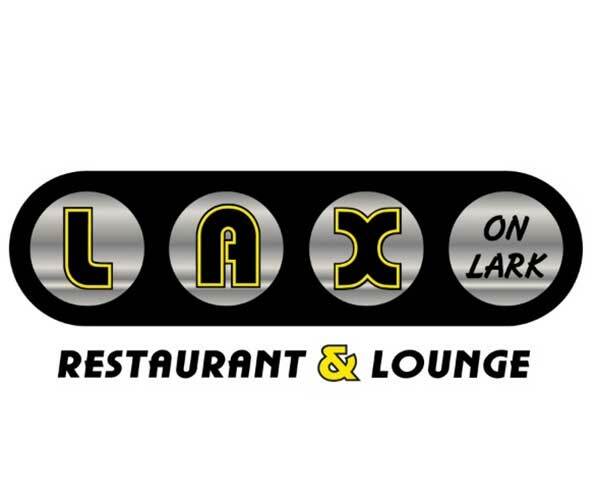 LAX on Lark Restaurant & Lounge Gift Card Giveaway! Enter this giveaway and you could win a $50 to LAX on Lark Restaurant & Lounge in Albany, NY just in time for the holidays! Enter to win a $25 gift card to the Wishing Well and Brook Tavern & a $50 gift card to the Olde Bryan Inn, for free. Get ready sports fans! Here's your chance to win 4 tickets to a Adirondack Thunder game on December 4th verus the Brampton Beast! Ready for the Holidays? Well, you will be once you've won $500 in gift cards/certificates for businesses in Saratoga Springs (six winners)! Enter for free here! Kick off the holiday season right with two tickets to the Preview Reception of the Catholic Charities' Festival of Trees in Saratoga on December 2nd ($150 value). Who doesn't love food, dancing, music & wine? Here's your chance to win two tickets to The Alliance for Positive Health's Beaujolais Nouveau Wine Celebration on November 20th. Win a SkinMedica® Vitalize Peel from Garcia Plastic & Hand Surgery For FREE! Enter for your chance to win a SkinMedica® Vitalize Peel by Garcia Plastic & Hand Surgery ($165 value). Win a $20 Gift Card to Saratoga's NEW Restaurant With Interactive Play Space! Enter for a chance to win $20 to the ALL NEW Saratoga's Kids Castle -- a restaurant with an interactive indoor play space for kids! Get ready sports fans! It's hockey time again! Here's your chance to win 4 tickets to a Adirondack Thunder game on October 24th verus the Manchester Monarchs! Two winners will each receive four race registrations for the Special Olympics New York's rUNDEAD 5k on October 25th, 2015! Choose from dozens of harvest and fall-themed beers and locally harvested and prepared food...for FREE! Enter to win two tickets to the Saratoga Harvest Fest. Enter this giveaway and you could win a $50 Gift Card to The Saratoga Winery (5 winners will be chosen)! Win Irish 2000 Music & Arts Festival Tickets! Enter for your chance to win tickets to the 2015 Irish 2000 Festival on Friday September 18th! Saratoga Showcase of Homes Giveaway! Enter for your chance to win a pair of Saratoga Showcase of Homes tickets! 10 winners will be selected! 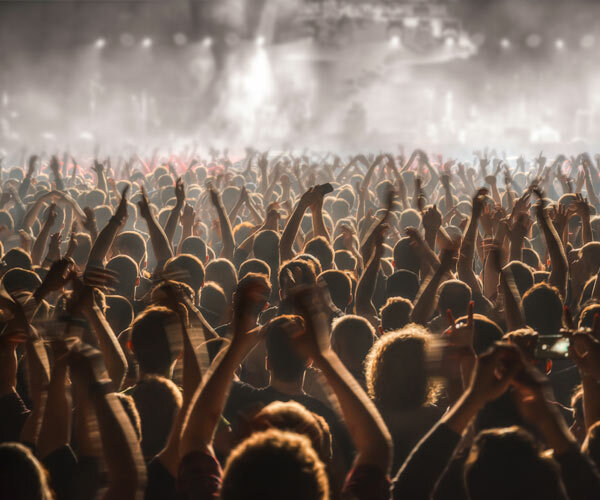 Enter for a chance to win 4 tickets to go see Chicago AND Earth, Wind & Fire play at Saratoga Performing Arts Center on August 29th! Enter this contest for a chance to win 2 free registrations for the upcoming Insane Inflatable 5k in Ballston Spa, NY on September 5th! Win a SkinMedica® Illuminize Peel from Garcia Plastic & Hand Surgery For FREE! Enter for your chance to win a SkinMedica® Illuminize Peel by Garcia Plastic & Hand Surgery ($125 value). Winner: William K, Tammy S, Deborach M-R, Stephanie C, Kristin H, Sara V-S, Deborach F, Matt F, Melanie W, Jen F.
Who doesn't love live music, signature drinks and delectable fare to enjoy? 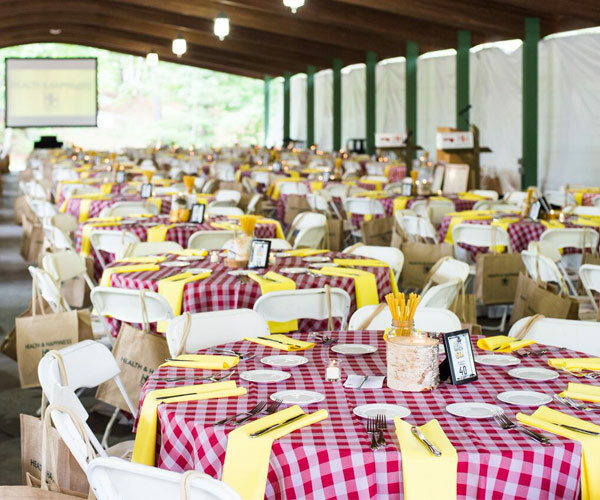 Here's your chance to win two tickets to the Shelters of Saratoga's One Fine Day Centennial Soiree on August 25th. Grab a drink, an apron and take a seat! Enter for a chance to win a Private Party for 15 to Saratoga Paint & Sip Studio! 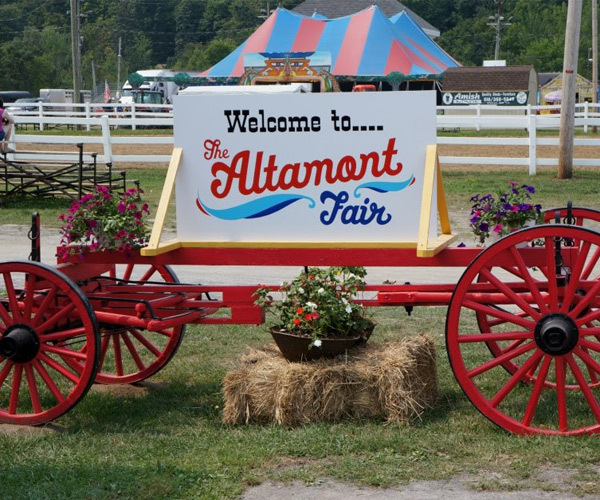 Win a VIP Family 4-pack to the Altamont Fair -- August 11th through August 16th. Enter NOW! Win a $100 Gift Card to the NEW Saratoga's Kids Castle -- Opening Soon! Enter for a chance to win $100 to the ALL NEW Saratoga's Kids Castle -- an interactive indoor play restaurant for kids! Enter for a chance to win 4 tickets to go see Def Leppard with Styx & Tesla play at Saratoga Performing Arts Center on July 24th! See Kim Waters at the Empire State Plaza on July 8th With Backstage Passes! Here's your chance to see Kim Waters with two backstage passes at the Empire State Plaza on July 8th! 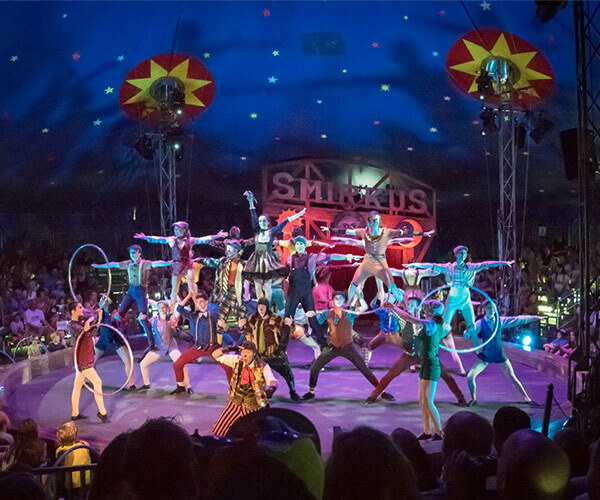 Circus Smirkus is Coming to Saratoga and You Can Go For Free! Come one, Come All To The Greatest Show On Earth - Circus Smirkus! This award-winning international youth circus is coming to Saratoga and you could go for free! Tri-City ValleyCats 4th of July Game Giveaway! Throw on your ball caps and break out your baseball mits, Sports Fans! Here's your chance to win 4 tickets to a Tri-City ValleyCats game! Don't miss out on your chance to go out to the Ball Game with your friends and family! Enter this giveaway and you could win a $20 to Villago Pizzeria & Ristorante in Ballston Lake, NY -- Minutes from Saratoga Springs, NY. 10 winners will be selected. Winner: Stephanie W, Tessa V, Steve S, Joseph C, Jessica V, Joel B, Loretta Z, Christine S. Jennifer B, Gordon M.
Win Tickets to See Train with The Fray & Matt Nathanson on June 19th at SPAC! Enter for a chance to win 4 tickets to go see Train with The Fray & Matt Nathanson play at Saratoga Performing Arts Center on June 19th! Win Backstage Passes to See Country Star Craig Wayne Boyd at the Empire State Plaza on June 17th! Enter to win two backstage passes to see Craig Wayne Boyd in Concert at the Empire State Plaza on June 17th! Winner: Aleah W, Gail I, Jenea S & Helen M.
Get ready Sports Fans! Here's your final chance to win 4 tickets to an Adirondack Flames game on April 11th versus the Lake Erie Monsters! Win Permanent Eyebrow Make-Up from North Country ENT & Med Spa For FREE! Enter to win permanent eyebrow make-up from North Country ENT & Med Spa for FREE ($450 value). Start summer a little early with a four-pack of tickets to the Great Upstate Boat Show on March 27th-29th in Queensbury, NY. Winner: Rachel A, Todd R, Denise P, Lindsey W, Gary S, Amy W, Michael V, Denise P, James C, Brent M, Lexi C, Jeff S, Dan M, Steven B, Isabella D, Debora B, Kristin H, Mary T, Sue P, Denise L, Jessie S, Jennifer L, Charles D, Guek L, Nancy H, aul W, Tina K, John T, Richard M, Darlene M, Alex C, David B, Michael N, Barbara M, Jarrett J, Lucie D.
Get ready Sports Fans! Here's your chance to win 4 tickets to an Adirondack Flames game on March 15th versus the Binghamton Senators! Winner: Jen F. & Dan M.
It's Game Time! Here's your chance to win 4 tickets to a Adirondack Flames game on February 28th verus the Toronto Marlies! What's better than sampling hard cider? Sampling hard cider for FREE, of course! Enter now for your chance to win ($60+ value per winner). Winner: Kasey G, Joscelyn C, Alexis C, Corinne C, Judy K, Gordon M, Scott R & Rachel A. Do you like beer? Do you like free beer? Then you should probably enter to win a pair of tickets to Saratoga Beer Week's Beer Summit on Saturday, February 21st ($100 value per winner). Winner: David M, Sara V, Pamela M, Jayne B, Lindsay M.
Relax your mind with a customized deep cleansing facial, eye treatment and make-up application at Esthetiques European Skin Care Clinique simply by entering to win ($200+ Value). Enter to Win an Overnight Stay to the Hampton Inn & Suites & a $75 gift card to Capital American Eatery in Downtown Albany just in time for Valentine's Day! Get ready Sports Fans! Here's your chance to win 4 tickets to a Adirondack Flames game on February 7th! Grab a drink, an apron and take a seat! Enter now for your chance to win a $100 gift card to Saratoga Paint and Sip Studio. Win a $50 Gift Certificate to Tubby Tubes Outdoor Fun Park! Grab your hot chocolate and enter this giveaway for a chance to win $50 to Tubby Tubes for a winter of snow tubing! Two lucky winners will win a FREE family Pass to the Iroquois Indian Museum. Sample 100+ Beers, enjoy live music & great food...for FREE! Enter to win a pair of tickets to Glens Falls on Tap. Enter to win a $25 gift card to The Inn at Saratoga, Gaffney's, The Brooke Tavern & The Local Pub & Teahouse, for free. Winner: Sarah D. from Saratoga Springs, NY. Saratoga.com Holiday Gift Card Extravaganza Giveaway! Ready for the Holidays? Well you will be once you've won $500 in gift cards in Downtown Saratoga (four winners)! Enter for free here! Winner: Evan R., Robert K., Lori S. & Kate D.
Kick of the holiday season right with two tickets to the Preview Reception of the Catholic Charities' Festival of Trees in Saratoga on December 3rd ($150 value). Who doesn't love food, dancing, music & wine? Here's your chance to win two tickets to the AIDs Council's Beaujolais Nouveau Wine Celebration on November 21st. Winner: Roseann C. & Nina L.
Enter to win a $50 Gift Card to Duo Modern Japanese Cuisine & Lounge (two winners will be selected)! Grab a drink, an apron and take a seat! Enter for a chance to win a Private Party for 15 to Saratoga Paint & Sip Studio's Latham Location! Enter for a chance to win a Family 4-pack to Field of Horrors in Brunswick, NY! Winner: Kevin C., Bobbi S, Lindsey B. & Laure T.
2 winners will each receive 2 race registrations for the Special Olympics New York's rUNDEAD 5k on October 26th, 2014! Enter this Albany.com contest for a chance to win a $100 Gift Card to The City Beer Hall in Albany, NY! Enter this contest for a chance to win a Family 4-pack (4 tickets, $20 food voucher, $20 in pumpkins) to Ellms Family Farm in Ballston Spa, NY! Get your home looking fabulous this fall with this FREE four hour organization session with Organized by Sharon! Dutch Apple Cruises is giving away two tickets to a Albany Trolley Tour and a Fall Foliage Sightseeing Cruise on September 20th or 27th. Click Below to Enter. Showcase of Homes Contest ($60+ value)! Enter for your chance to win a pair of Showcase tickets! One Grand Prize Winner will receive 4 Tickets for the Showcase and Chefs "Comfort of Homes" event! 3 winners will be selected to receive $100 gift cards for Northshire Bookstore located on 422 Broadway in Saratoga Springs, NY! Win Two Tickets to go see Cher when she performs live at the Times Union Center on September 11th, 2014! Winner: Gordon M, and Courtney D.
Enter for your chance to win the first place prize of a Private performance from the Schenectady Pipe band OR the second place prize of 2 VIP Tickets to Capital District Scottish Games (August 30/31st, Altamont Fairgrounds) AND 1 Private Performance from a 2-piper & single drummer ensemble!!! Enter our contest for your chance to win 2 Fun Cards ($42.50 value each)to the Funplex Funpark in East Greenbush! Grab a drink, an apron and take a seat! Enter now for your chance to win a $150 gift card to Saratoga Paint and Sip Studio! Enter NOW for your chance to win two day passes and four preferred seating tickets to the Rodeo at the Washington County Fair August 18th or 19th! Win a $100 Gift Certificate to River Ridin'! Win tickets to Saratoga Polo Association! Enter now for your chance to win 4 tickets to attend a Saratoga Polo Association match this season! Don't miss out on this awesome prize! Win 4 Sarah Mclachlan Tickets! Enter for a chance to win 4 tickets to go see Sarah McLachlan play at Saratoga Performing Arts Center on July 16th! Enter for your chance to win 4 tickets to this year's Saratoga County Fair! 20 Winners will be chosen!! Grab your bathing suit and enter this giveaway for a chance to win a $50 to Tubby Tubes for a summer of fun (two winners will be chosen)! 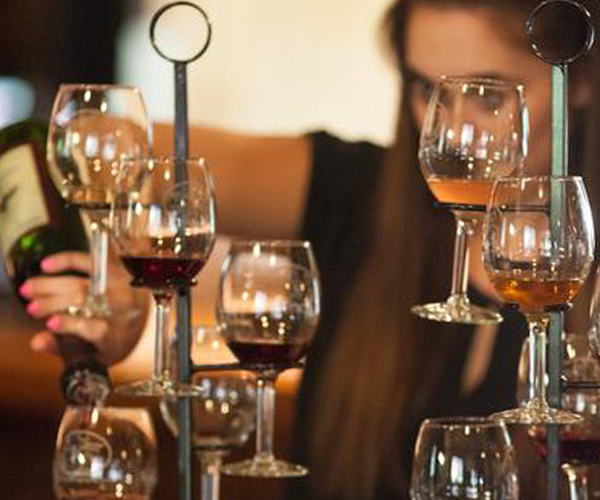 The Upper Hudson Valley Wine Trail is giving one lucky winner 2 Wine Trail Passports, an Overnight Stay at the Hilton Hotel at the Saratoga City Center, and dinner for Two at the Thirsty Owl Bistro! Enter to win Four tickets for the Hidden City House & Garden Tour in Albany, NY on Thursday, June 26! Enter this contest for a chance to win a PSP "The Little One" Training Club and a 1-hour Golf Instruction with CV Golf (a $150 value)! Win 2 Saratoga Arts Festival Passes- a $40 value per pass! Enter to win 2 Free Passes for the Saratoga Arts Festival on June 11 - June 15! Winner: Randolph B., Ryan S. , and Rich M.
Here's your chance to see George Thorogood with two Backstage Passes from the Empire State Plaza! Click to enter. Here is your chance to win tickets to Justin Timberlake's 20/20 Experience World Tour from Downtown Albany! Win 2 FREE premium tickets to see Justin Timberlake perform LIVE at Times Union Center on July 16th ($200+ value). Enter to win two backstage passes to see Kellie Pickler in Concert at the Empire State Plaza on June 11th! 9 lucky winners will win a FREE family membership to the Iroquois Indian Museum ($35 value). The membership includes admission for the family and many more discounts. Winner: Aleah W from Saratoga Springs, Steve K from Schenectady, Dawn L from Cadyville, Sara D from Guilderland, Darren C from Duanesbury, Janis W from Glens Falls, Charlotte Z from Old Forge, David C from Hudson Falls and Mary C from Scotia. Honoring mothers and daughters (stylishly) with menu choices from their Original Style Bar, the Little Ladies Style Bar and their brand new Braid Bar! Winner: Ashley C and Angela C! Winner: Dan M. from Hoosick Falls, Donna W. from Saratoga Springs, Joan W. from Niskayuna, Arthur F. from Albany and Nicole E from Rensselaer. Move Music Festival Ticket Giveaway! Want to see over 100 LIVE music acts in one jam-packed weekend FOR FREE? Enter this giveaway for your chance to win two tickets (wristbands) to the Festival! Win a $100 Gift Card to Javier's Nuevo Latino Cusine in Saratoga Springs, NY! Enter to win this $100 Gift Card to Javier's Nuevo Latino Cusine! Rod Stewart & Santana Show Ticket Giveaway! Want to see Rod Stewart and Santana LIVE on May 23rd at the Times Union Center for FREE? Enter this giveaway for your chance to win two tickets to the show! Craft New York Beer Fest Ticket Giveaway! Enter here for your chance to win 4 free tickets to the Craft New York Beer Fest on March 22nd in Albany (a $160 Value). The Great Upstate Boat Show: 4 Pack of Tickets Giveaway! Enter this giveaway for a chance to win a four-pack of tickets to The Great Upstate Boat Show on March 28-30 and April 4-6 in Queensbury, NY. Winner: Paul W, Elise O, Robert B, Robin B, Jan G, Kelly S, Ashley T, Steven K, Janet G, THomas T, Lisa H, Pat G, Patricia J, Alex C, Sherry L, Amy W, Andrew Z, Paul W, Janet M, Diane S, Nadine A, Bill S, Rachelle P, Laura H, Christine T, Christina A, Melissa C, Michelle W, Marc M, David F, Darlene M, Patricia J, Greg L, James C, Michael H, Tanya F.
Win a Two (2) Pack of Lift Tickets to Oak Mountain (four winners)! Get out of the house and enjoy the wintry weather! Enter now to win a 4 pack of lift tickets to Oak Mountain Ski Center in Speculator, NY. Winner: Nancy H from Wilton, NY. Laure T from Schenectady, NY. James C from Mechanicville, NY. Patrick M from Clifton Park, NY. Win a FREE overnight stay at the Hampton Inn & Suites Albany Downtown! Enter to Win an Overnight Stay to the Hampton Inn & Suites in Downtown Albany, NY! Dust off that old ball gown and enter for your chance to win a pair of tickets to SPAC's Winter ball on February 22nd. Saratoga Paint & Sip Night Out for Four (Saratoga & Latham Locations)! Enter this giveaway to win painting for Four at Saratoga Paint & Sip (locations in Latham and Saratoga Springs)! Enter to win this $100 Gift Card to Duo Modern Japanese Cuisine & Lounge just in time for Valentine's Day! Win a 5-Pack of Classes to Saratoga Cycling Studio! Enter to win a 5-Pack of classes to the Saratoga Cycling Studio, for free. 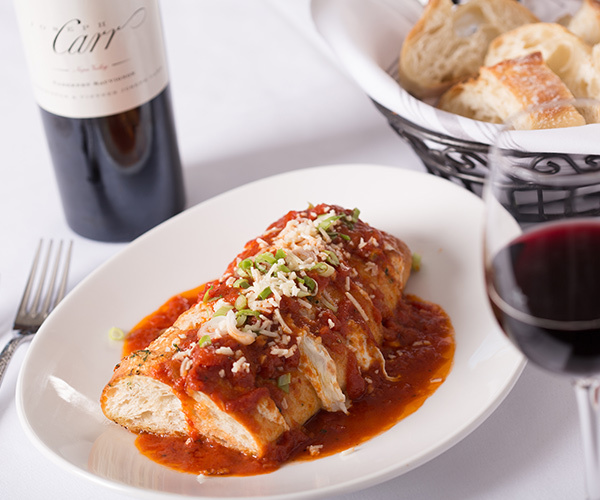 Win a $50 gift card to the fine dining Italian Restaurant, Grappa 72 Ristorante! Enjoy some fine dining this winter with a $50 gift card to Grappa 72! Enter to win $50 to Tubby Tubes Outdoor Fun Park! Keep your winter beautiful with a flowers purchase from Calbulbs.com! Click here to like their page to enter! Enjoy some fine dining this holiday season with a $50 gift card to Grappa 72! Win $100 in Gift Certificates to Tubby Tubes Outdoor Fun Park! Enter to win $100 to Tubby Tubes Outdoor Fun Park, for free. 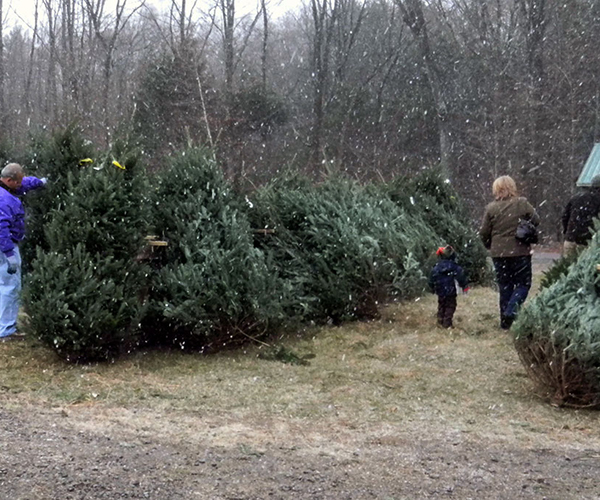 Enter to win two wreaths, a Christmas tree and a dozen apple cider donuts, for free. 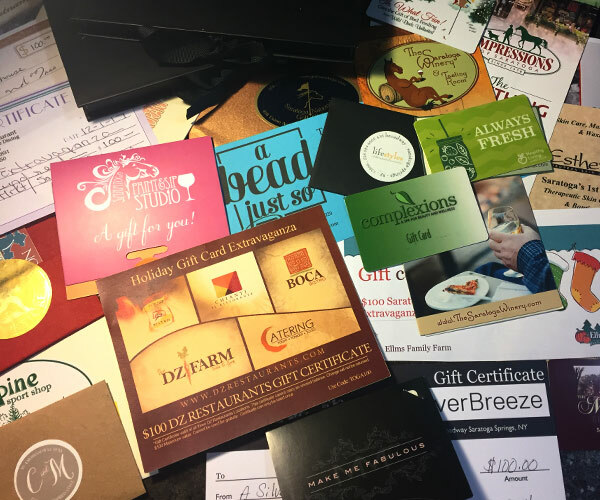 Enter to win an overnight stay at the Hampton Inn & Suites, a $50 gift card to Bellini's or Jacob & Anthony's and a $25 gift card to Gaffney's, for free. Saratoga.com Holiday Shopping and Dining Spree! Ready for the Holidays? Well you will be once you've won a $1500 Shopping and Dining Spree in Downtown Saratoga! Enter for free here! Enter for your chance to win this incredibly emotional book by Jon Katz, owner of Bedlam Farm and New York Times best seller. Enter for a chance to win $150 in dry cleaning with Feigenbaum Cleaners and get all those sweaters and jackets cleaned just in time for Winter! Win a Halloween Hayride at Ellms Farm! Enter for a chance to win tickets to ride the Ellms Farm Hayride this Halloween! Enter to win a $100 gift card to Scoville Jewelers, located in the heart of downtown Glens Falls! Giveaway courtesy of Glens Falls Tile & Supplies. Win a Family Fun Day at Ellms Farm! Take the family to Ellms Farm for a day of fun this fall! Enter our contest to do so for free! Win a Pair of Tickets to Oktobeerfest! Enter for your chance to win a pair of tickets to the upcoming Oktobeerfest at Saratoga County Fairgrounds! Win an Apple iPad Courtesy of The Lofts at Harmony Mills! Enter here for your chance to win an Apple iPad mini courtesy of The Lofts at Harmony Mills, luxury apartments in the heart of the Capital Region! Enter now to win a FREE fresh cut Calla Lily bouquet from CalCallas.com shipped right to your door! Win FREE Tickets to Showcase of Homes Event! Enter once per day for your chance to win FREE admission to one of Saratoga's most cherished events! You could win 4 tickets to see KId Rock and ZZ Top at SPAC, Enter here for your chance to win! Enter our giveaway to win $100 to raft and ride down the Sacandaga with River Ridin'. Enter here for your chance to win 4 FREE lawn tickets to the Big Time Rush concert featuring Victoria Justice at SPAC on July 27! Enter here for a chance to win 2 FREE tickets to this year's Capital Region Craft Brewers Festival! Enter here for your chance to win 4 FREE lawn tickets to see Matchbox 20 at SPAC. Enter here for your chance to win a FREE pair of tickets the 2013 Parrothead Festival! Winner: Jason F. and Kristina G.
Win a family pack of tickets (2 Adult and 2 Children Rusher Race Entries) to the 20123 Hero Rush obstacle race. Be prepared to test yourself mentally and physically while having a great time through this 3 to 5 mile course. Experience traditional Italian food at it's finest! Grappa 72 is one of Albany's best Italian restaurants, and this is your chance to win $50 gift card! Win $50 Gift Card to Pasta Factory! It's all about the pasta! Enter now for your chance to win a $50 gift card to the Pasta Factory in Latham! Enter now for your chance to win a free $250 AMEX gift card to the Crossgates Mall. Win a FREE ticket to Girlfriends Getaway weekened! Enter now for your chance to win a free ticket to Girlfriends Getaway weekend in Bolton Landing ($100 value). Enter now for your chance to win a gift certificate for a party of 5 to Saratoga Paint and Sip Studio (worth $200). Win Tubing and Lift Tix to Hunter Mtn.